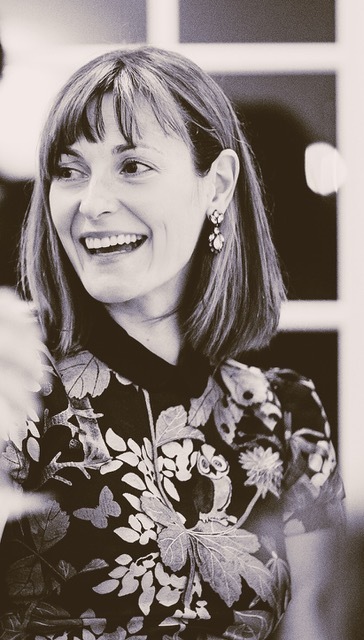 So excited to do a little Q&A with the lovely Vicky Wight, the writer/director who is bringing The Lost Husband to the big screen! Vicky is one of my favorite people. She’s gracious and lovely with a wry sense of humor and a tenacious bravery that I so admire. Every time I’m around her, I wish I could just stay right there. She adapted my novel The Lost Husband into a screenplay, filmed it last fall, and is now in the final stages of editing and sound production. What was it about The Lost Husband that made you want to adapt it into a movie? How did you know this was a project for you? I read The Lost Husband at the behest of our mutual friend, Maria Zerr. In fact, she left it on my doorstep. I read it in two days and immediately wanted to make a film. In my heart, I knew how to bring the characters and the setting to life. That’s the intrinsic beauty of your writing. You create characters we see or want to see in our daily lives. So, this was an instance of a project finding me. I usually work from an original idea, but the world you built was undeniably appealing on so many levels. I had to take the leap and make the film. You adapted the novel The Lost Husband into a screenplay. What was that process like? What was the hardest part? What was the easiest? I love writing in any capacity. I had not adapted from a novel but found the experience really satisfying. The only sad part about adapting a novel for the screen is that you really have to streamline. I had to rework storylines to fit into a limited amount of time and rework them again while editing the film. The film is different from the novel in many ways. It still has the essence of every character and the structure of the novel’s story arc, but we did lose a few funs scenes. The heart of the story is there however. What was the casting process like? How did you know who would be best to play those characters? Getting a film made is akin to conjuring a miracle! Casting is no less stressful than fundraising, producing, writing, or selling a film. It is a constant and focused effort for months, days, and sometimes even the hours leading up to the first moments of production. I remember you and I had a conversation a year before the film started shooting and you were worried the film might never go. It was totally reasonable to be worried about that because the movies that do get made take years and years and years to make! TLH was no exception! I always stressed that I wanted to develop the film until I could find the right cast. It wasn’t easy, but once Leslie Bibb (who I have loved since her days on Line of Fire) said yes, we were off to the races. She was an integral part of the process thereafter, helping attach Josh and really going to bat to get Sharon Lawrence and all the other cast attached. I had worked with Nora Dunn on another film and knew she was right for the part and I had always wanted to work with Isiah Whitlock Jr.! Working with him was a dream come true for me. Same with Herizen Guardiola, Kevin Alejandro, and, of course, Josh and Sharon! The wonderful child actors (Callie, Roxton, and Stone) were all cast in Texas. 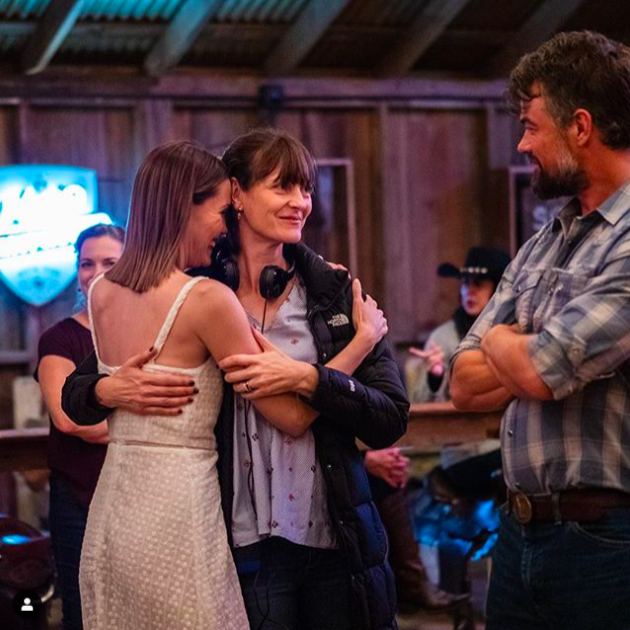 Vicky on the set of the dance hall scene with stars Leslie Bibb and Josh Duhamel. All of them. Truly. Every single one! I absolutely love the dancehall scene. It’s a bit different than it was in the novel but no less romantic. This was a big project! How many people worked on this movie—a hundred? What’s it like to manage so many different details/elements at once? 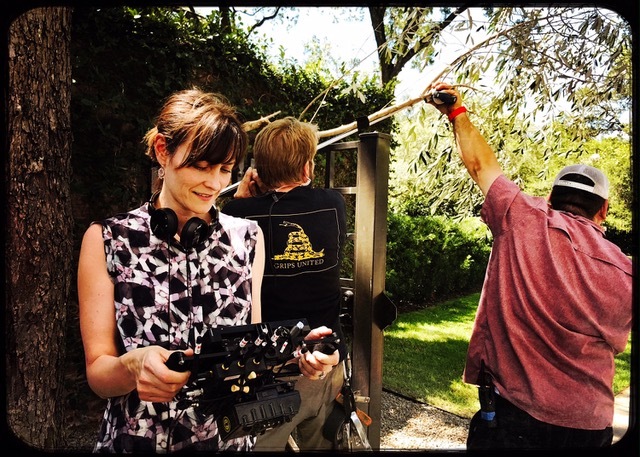 Do you have to be a pretty great multi-tasker to direct a movie? We had over 100 people working on the film from pre-production, production, to post-production. Making a film for me is both the most creatively challenging and creatively rewarding experience imaginable. I love my crew and believe in having a very positive, fulfilling, and happy set. The crew is the bedrock. Without them, I’m nowhere. Same with my actors. I love them and I’m willing to go to great lengths to make them feel comfortable in their environment so they can do the work their way. You do have to successfully multi-task to be a good director but you have to find a real balance juggling a hundred things at once while being able to focus on the art and performance and also make the right and/or best decision at any given time. The intensity of that is invigorating. I love creating with the actors in rehearsal and on set. I love improvising with them and letting them take their character where they feel they should. I also love the process of building a shot and pushing myself technically when it comes to lenses and composition. 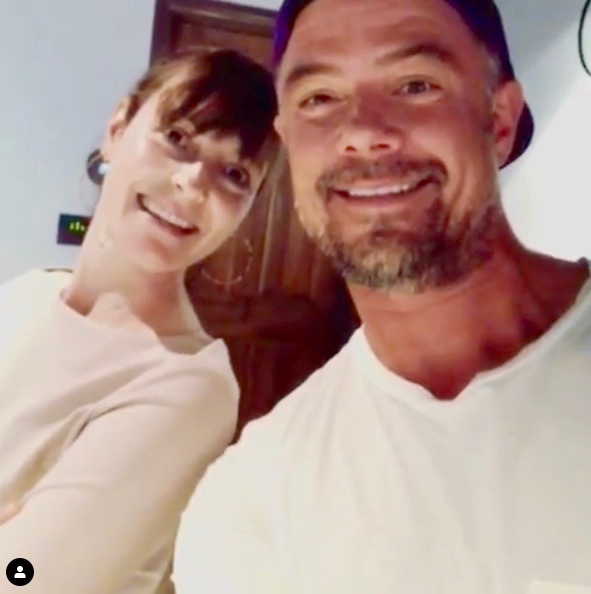 Vicky goofing around with Josh Duhamel. To that end, my goal was to open the film with a sort of love letter to Texas. One of my favorite shots in the film happens very early. It threw everyone for a loop when I initially described what I wanted to accomplish. In short, I wanted to push through the window of a moving car past the lead actor (who was driving over a bridge) out the closed passenger-side window up and out over the Brazos River. Working together, we did. What’s something about directing a movie that most people don’t know? It’s very taxing on your body. You stand, run, and walk ALL day and/or night. Your day lasts anywhere from 14 to 18 hours or more! What was it like to work with stars Leslie Bibb and Josh Duhamel? They are both sublime. They had excellent chemistry – a gift when you need your characters to have something unspoken happening between them! How did you pair songs with particular scenes for the soundtrack? Music to me is basically as important as picture. I worked with an extremely talented composer, Sherri Chung, to find the right themes. Her work is really something to behold when paired with the imagery of the film. As far as soundtrack, I love Bob Schneider’s melancholy melodies* as well as his more upbeat compositions. I licensed many of the songs I had listened to for inspiration while adapting the novel into the screenplay a few years ago. I was also lucky to license music from an excellent local musician, Andy Stepanian of Wrinkle Neck Mules. 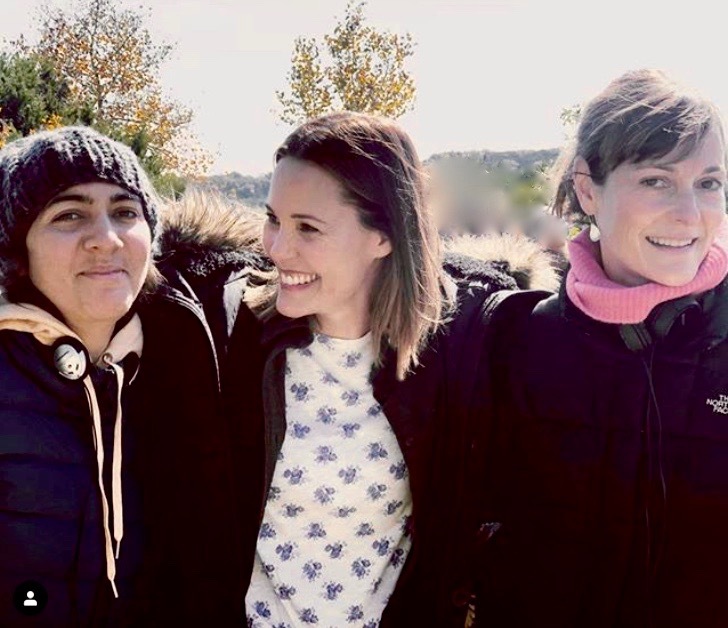 Vicky with producting partner Bridget Stokes and star (and producer) Leslie Bibb. Were there any great scenes that wound up on the cutting room floor? What’s it like, being a director? What’s a day in your life like? Honestly, I’m mostly a writer in my day-to-day life. I love directing, but I don’t get to do it very often! I’m always developing a project or working on a script. I’m constantly writing, rewriting, and rewriting more. What stage is The Lost Husband production in now? We are currently mixing sound and music so we are very close to having a final film. We’ve all heard about how women in Hollywood face discrimination. What can we do to support women working in the industry? Go to movie theatre and see films made by women. Watch them on Netflix, Hulu, Amazon – anywhere it will make a dent in the numbers. If you’re watching a film made by a woman or have paid to see a film made by a woman in a theatre, she might get to make another movie down the road. If we’re making money, we’re making movies. ***Follow Vicky on Instagram HERE! And see THE CUTEST video ever of Vicky and Josh Duhamel goofing around HERE. *And here’s a Bob Schneider song, if you’d like to hear one! I have no idea if this one is in the movie, but after Vicky played it for me, I became obsessed with it, and I spent many weeks driving around with this song on repeat in my car.